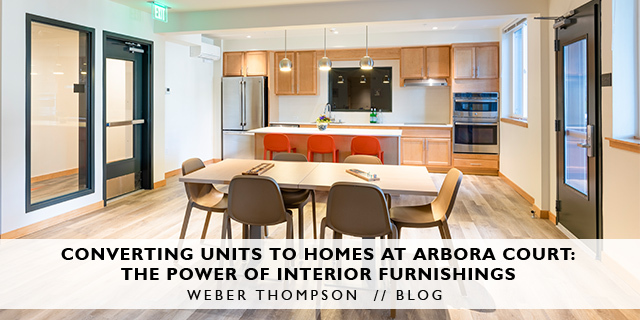 Bellwether Housing and Weber Thompson have been working closely together for the past four years to complete Arbora Court, a low-income housing project providing 133 new homes for Seattle. Forty of these units are specifically for families transitioning out of homelessness, which is the group being most quickly displaced in Seattle’s insane housing crunch. The project was completed in June and residents have moved in – many of whom are finally feeling relief from the financial burden of housing costs allowing them to focus on what is most important – their family. 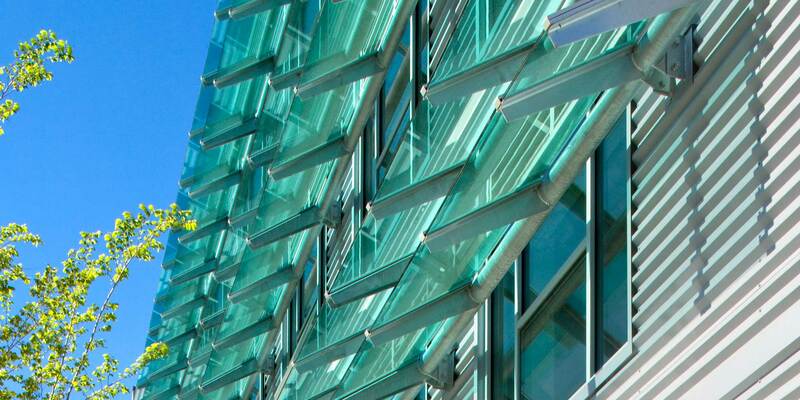 Arbora Court was founded on the premise of community collaboration and investment. The University Christian Church (UCC) across the street from the site made the project possible by selling the land (a former parking lot) to Bellwether at a much reduced cost because they recognized the desperate need for affordable housing and wanted to help. In exchange, Arbora Court includes below grade parking for the Church. Overall, it is a win for everyone involved. Drawing on this project legacy of community investment, our team wanted to do more. Our Affordable Housing Studio started off the year with a brainstorming session of ways we could make a bigger impact. While we had many great ideas, we landed on one we knew was most up our alley. Capitalizing on our internal resources, we decided to help Bellwether furnish the common areas of Arbora Court. They had already begun fundraising to furnish the units, but community areas throughout the project needed a ‘homier’ feel. As a member of the interior design team, I was eager to take the idea and run with it! We work with many wonderful vendors, and I knew I could reach out to them to source more donations for the project and really continue the legacy of community care and involvement. I made a donation request informational packet and sent it to our furniture vendors. As anticipated, the response was heartwarming. While the specificity of pieces we were looking for made it difficult for all of the vendors to donate, we were able to narrow it down to a handful of pieces to furnish the on-site Supportive Service offices and the spacious community elevator lobbies. Esther Du Graf of DuGraf donated three amazingly comfortable new task chairs for the offices. Annie Durfee of Open Square sourced three desks for the office spaces as well. Nancy Kahn of TINT Design Resource graciously offered beautiful wicker lounge chairs to furnish the elevator lobbies, which was a particularly difficult need to fill because they couldn’t be upholstered (for sanitary purposes) and needed to work well with the brightly colored marmoleum flooring. Thank you, thank you DuGraf, Open Square, and TINT for your support and willingness to pitch in! You are truly inspirational. In summary, the tradition of pooling resources and working together for the greater good lives on at Arbora Court. This was the project ethos from the beginning to the very end, which I am incredibly proud to be a part of. As an avid urbanist, I think it is critical that cities are inclusionary and supportive of people of all socioeconomic backgrounds. Affordable housing is the primary way cities can maintain diversity. I hope that this project will encourage more sharing, collaboration, and pooling of resources in a society that feels increasingly fragmented. After all, we’re all in this together, aren’t we? Lissa Goetz, AIA, LEED Green Assoc. is a member of the WT Interior Design and Affordable Housing Studio where she brings a unique skillset of technical and creative talents. Lissa is also an advocate for the affordable housing community and has experience working directly with disenfranchised, low-income communities in California and Seattle.